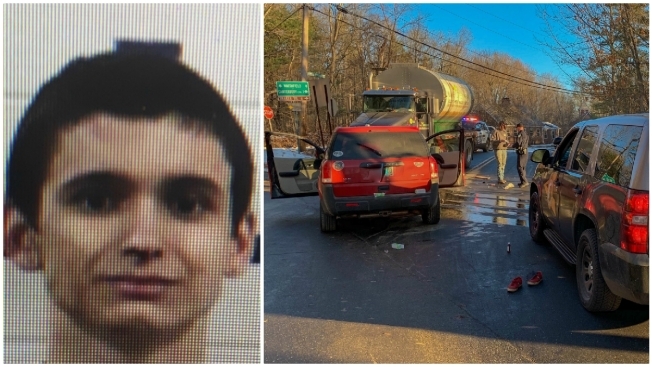 A New Hampshire teenager is facing numerous charges after police say he allegedly assaulted a woman with a pipe after a car crash and then tried to steal two state police cruisers Friday morning. Alan Clark, 18, of Hillsboro, is charged with reckless operation, conduct after an accident, resisting arrest, and two counts of felony escape. State police said a trooper responded to a crash at 7:46 a.m. at the intersection of Route 132 and Kimball Pond Road in Canterbury. When the trooper arrived, one of the drivers, identified as Clark, began to walk away from the crash scene and the trooper. When the trooper told Clark to stop, authorities said he ran toward the trooper's cruiser, got into the driver's seat and accelerated. Police said the trooper struggled with Clark so he couldn't put the cruiser into drive. While the struggle was taking place, the trooper's disjointed radio transmissions and yelling prompted multiple state and local police to respond. Clark was eventually pulled from the cruiser, taken to the ground and handcuffed while struggling through the arrest. Authorities said when Clark was placed into the back of a second state police cruiser, he then climbed through an open part of the partition that separates the front and back seats. In an attempt to escape, police said Clark put his foot on the gas of the second cruiser. Troopers were able to remove him again, re-handcuff and shackle him. Authorities said prior to police arriving, a woman had stopped at the crash site to check on the occupants. When she approached Clark, he allegedly assaulted her with a piece of pipe. A warrant has been prepared for additional assault charges. Clark is being held at the Merrimack County Jail and is scheduled to be arraigned Dec. 3 in Merrimack County Superior Court.